Lone Star Park opens its 2019 Thoroughbred Racing Season on Thursday, April 18 for a 44-day run and has 13 stakes races on the schedule worth a combined total of over $1.1 million dollars. The stakes action will kick-off with the featured $50,000 Bluebonnet Stakes on opening night. The six and one half furlong contest on dirt is for Texas-bred fillies & mares, 3-yr-olds & up. With an added $100k to the purse, the now $300,000 Grade 3, Steve Sexton Mile, for 3-yr-olds & up headlines the 2019 Stakes Schedule. The 23rd edition of the event will run on Sunday, April 28. Past winners include Bee Jersey (2018) and Mor Spirit (2017) both of which went on to win the $1.2 million Grade 1, Met Mile at Belmont Park. Hall of Fame trainer Bob Baffert has trained winners of this event a record four times, and horses sent by Hall of Fame trainer Steve Asmussen have won it three times. Track officials are excited to introduce new to the stakes line-up this year, the inaugural $100,000 Lone Star Park Turf Stakes for fillies & mares, 3-yr-olds & up. It will be contested on Memorial Day, Monday, May 27. 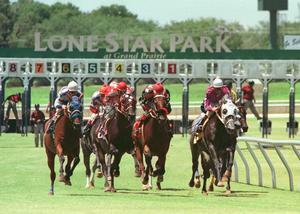 Two dates will celebrate Texas-bred horses with four stakes each. Saturday, June 23 is Lone Star Showcase Day featuring the divisional Texas Stallion Stakes for 2-yr-olds. They are the $65,000 Staunch Avenger Division for colts & geldings and the $65,000 Pan Zareta Division for fillies. Both divisions will be run at five furlongs on dirt. Also featured are the $50,000 Wayne Hanks Memorial Stakes for Texas-bred 3-yr-olds & upward at six and one half furlongs on the main track as well as the $50,000 Lane's End Danny Shifflett Scholarship Stakes for fillies & mares, 3-yr-olds & upward at seven and one half furlongs on turf. Stars of Texas Day, presented by Highlander Training Center is Sunday, July 14 and will feature four stakes. The $50,000 Valor Farm Stakes for Texas-bred fillies & mares, 3-yr-olds & upward at six furlongs on dirt, the $50,000 Assault Stakes, presented by Highlander Training Center, for Texas-bred 3-yr-olds & upward at one mile on the turf. Also scheduled are two divisions of the Texas Thoroughbred Futurity which are the $100,000 fillies division and the $100,000 colts & geldings division. Eligible horses are 2-yr-olds which are graduates of the 2019 Texas Thoroughbred Associations Two-Year-Olds In-Training Sale and all Accredited Texas-bred horses. Each futurity division is five and one half furlongs on dirt. For the complete schedule please refer to the chart below. This entry was posted in The Biz and tagged bee jersey, lone star, lone star park, lone star park turf stakes, mor spirit, stakes schedule, steve sexton mile, thoroughbred by Press Release. Bookmark the permalink.